﻿ Ivan Krasko and Natalya Shevel's wedding. First photos. The main > Stars> Ivan Krasko and Natalya Shevel's wedding. First photos. It is known that after leaving of the previous wife, the actor left all the property to her and two sons. Now Krasko does not have anything, except his popularity and a salary at theater. Even there lives the actor at the daughter-in-law and the grandson. Users of the Network are perplexed — why the young girl needed this misalliance. However, everything already came true! Yesterday in one of Petersburg registry offices Ivan Krasko and Natalya Shevel registered the marriage. On the Internet there were first photos from a wedding which became one of the most anticipated events of the last week. It is a uniform which I wore in 23 years. I decided to return to your age when I was such. You understood it? Estimated? On the bride the modest lacy dress "in a floor" was put on, and the hairdress was decorated by a veil. As the witness of the groom the theater director Komissarzhevskoy where the actor serves acted. Her friend on university became the witness to the bride. Natalya's mother did not arrive on a wedding, having decided to stay at home in the Crimea. According to insiders, the woman very much was negative to the daughter's choice. 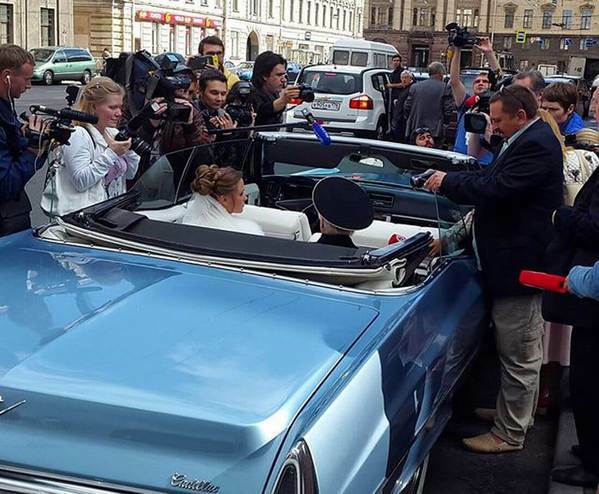 After marriage registration the young went on walk across St. Petersburg.